The Spandrel Oval is made up in two parts, the outside frame is the Morland profile and the inner oval section is plain with a raised sight edge. The sizes refer to the APERTURE at it's maximum. The oval section is recessed allowing you to fit a panel or board behind. Not suitable for stretched canvases, the canvas would need to be removed from the stretcher bars. 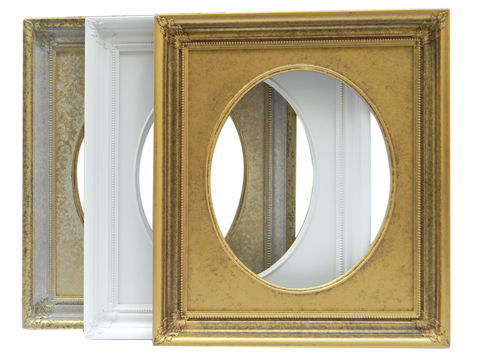 These Frames come in 3 sizes and in 3 finishes. The Gesso finish is a super smooth Gesso, ready to gild or leave for a bright white. The Gold is a slightly mottled gold over a darker underleaf. The Ivory Pale Gold is a gold wash over an Ivory base. SPAN- GES - 16x20 x 1 For example for one Gesso Spandrel 16" x 20"